Flashback 20 years ago and we have ER. Yes. Twenty. Flashback to the Media Access Awards in 2007, where Maggie and Jimmy Doyle met up again! 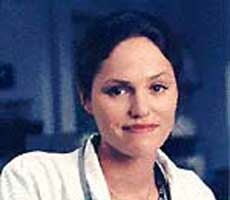 1997 was when a lot of you learned who Jorja Fox was, and was really the start of this website’s popularity. Back when Jorja was on Thursday nights, and her hair was curly and short! 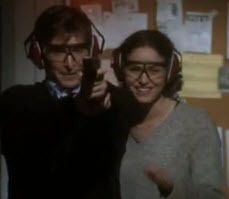 Maybe it was “No meat, no men, I’m your woman.” Or perhaps it was that she practiced one-handed sutures on an eggplant, read Face-Off magazine, had a gun, and stashed beer in the hospital fridge. Whatever your reason, you liked Maggie Doyle too. Its Thursday and Jorja’s not on tonight’s CSI. What’s a fan to do? How about reading The Advocate from 1997 and Los Angeles Magazine from 2003? Things are slow. How about some videos? Jorja was in the ER ‘episode’ “Retrospective”, where cast members, past and present, talked about the show. Videos, recaps and images included in the post.